The cotton robe I’m wearing keeps sliding me off the wooden stool I’m supposed to be sitting patiently on. But I have to wear the slippery robe because I’m not wearing too much else. And I’m not wearing too much else because I’m about to spend the next two minutes of my life in a cryogenic chamber set to -254 degrees Fahrenheit. Joanna Fryben and I are sitting in the back of the Metro Athletic Club in Tenafly, NJ, where her company, KryoLife, has set up their first “cyrosauna.” Just beyond the vending machines and the indoor golf room (complete with astroturf and cutouts of angry golfers) is a small office with wooden floors, a sheepskin rug, and a cryogenic chamber. The machine itself is about eight feet tall, padded on the inside, and its whirring is much noisier than I expected. Two-hundred and Fifty-four degrees below zero is about three times as cold as Antarctica’s coldest months, and far brisker than any winter this Arizona native has experienced. Basically, I’m staring into the mouth of what is sure to be my cryo-coffin. Using cold temperatures to help the healing process is a very old idea, dating all the way back to the ancient Egyptians. Whole body cryotherapy, however, takes the simple ice pack to another level. In whole body cryotherapy (WBC), people like me stand in a cryogenic chamber for one to three minutes at anywhere between -184 and -292 degrees Fahrenheit. Patients who use WBC report that the rush of endorphins they feel helps with depression, anxiety, fibromyalgia, rheumatoid arthritis, psoriasis, tinnitus, and a growing list of other ailments. It’s also becoming increasingly popular in the world of professional sports: the Knicks, Nike, WWE, and even Olympians have all been reported to use whole body cryotherapy. But the science behind WBC is often scattered, contradictory, or just plain absent. As I take off my robe and step into the chamber, Fryben give me two rules: Keep turning around and breathe slowly. The first minute is easy, before your body really hates you. It becomes quite Zen, actually. I follow Fryben’s instructions like a guided meditation. But in the second minute, when the cold catches up to you, it can be suffocating. What were described to me as “light tingles” I instantly identify as “painful icicle punches” all over my arms and thighs, and I begin to realize that nothing makes time pass slower than counting down seconds. I start to focus on the mirror above me, watching the color leave my face. I don’t want to remember what standard room temperature is; it’ll only make me jealous. “Think fondly of me…” I want to whisper dramatically through the fog. It would truly be a hero’s death. But before I completely resign myself to an icy demise, Fryben’s countdown reaches zero and she opens the door of the chamber. The gas pours out around me, like a forgotten scene from Spinal Tap, and I emerge with adrenaline pumping through my veins. I made it. I’m here. I’m alive. I’m standing in silly wooden clogs, clacking on a hard floor through a sheepskin rug in the suburbs of New Jersey. You may hand me my trophy now. “Whatever sounds too good to be true usually is,” says Paul Glat, a Philadelphia-based cosmetic surgeon, “We need some real hard data to convince people.” Glat and Fryben recently embarked on a collaboration to start test-driving whole body cryotherapy in Glat’s practice to speed up his patients’ recovery from surgery. Essentially, whole body cryotherapy intentionally but non-invasively damages your body in order to take advantage of its own healing processes. The coldest an ice bath can get while still technically being a “bath” is 32 degrees Fahrenheit – a far cry from the -254 I felt in KryoLife’s Juka cryosauna. “When you cool the skin that rapidly, the temperature receptors in your skin actually freeze rather than getting cold,” explains Glat. “The brain thinks, ‘This is it, we’re gonna die, so let’s give it all we’ve got.’” That adrenaline-fueled fight-or-flight response causes the body’s blood vessels to constrict and blood pressure to increase. That sends blood from your limbs to your core in an effort to, you know, keep you alive. There, the blood gets all nice and oxygenated. So, when you get out of the chamber and don’t die, that’s the blood that rushes back to your (probably numb) limbs. Proponents of whole body cryotherapy believe this process is at the root of all its beneficial effects. But how that core process can be effective for so many conditions remains up for debate, admits Giovanni Lombardi, a scientist at the biomedical research IRCCS Institute in Italy. The hypothesis with the most evidence behind it, he says, is that all cold therapies (not just whole body cryotherapy) ease the immune system away from inflammation; and whole body cryotherapy just does so to a more extreme degree. And, Glat says, it’s entirely possible that it’s the adrenaline released in response to that extreme cold that’s responsible for those anti-inflammatory effects. But that’s still just a hypothesis. That hypothesis has been intriguing enough to examine since the late 1970s, however, when Japanese scientist Toshiro Yamauchi first introduced whole body cryotherapy. More recently, Lombardi and his team published a paper in PLoS One this February that found 15 whole body cryotherapy treatments significantly reduced red blood cell count in professional rugby players. And a paper they published in September looked at whole body cryotherapy as treatment for fibromyalgia. He explains that in the fibromyalgia study, using whole body cryotherapy in 15 consecutive sessions along with medication significantly improved the subjects’s “quality of life” (measured on scales of pain, mental health, and fatigue) compared to the group that only received medication. In the paper, they speculate that this is because WBC’s anti-inflammatory effects may also have indirect effects on the body’s pain management system. Another experiment lead by researcher Anna Lubkowska at Szczecin University in Poland, showed that there may even be different effects of whole body cryotherapy depending on the number of sessions, suggesting that the more sessions you can stand, the better. Lubkowska’s work has also shown that repeated whole body cryotherapy treatments can reduce the number of free radical reactions in the body and significantly increase white blood cell count. But yet another study, this one lead by Joseph Costello, a physiologist at Queensland University of Technology in Brisbane, Australia, showed no real benefits of whole body cryotherapy for muscle damage over the traditional ice bath. Participants were equally sore after intense leg exercises whether or not they got the experimental whole body cryotherapy treatment. He followed that up with a study published this summer that measured knee skin temperature rather than cryo-chamber temperature. They found that even though WBC got skin cooler, it warmed up again much faster than if they had been in a cold water bath, and neither treatment got skin cold enough (below 55.4 degrees Fahrenheit) to be analgesic. And a study published in 2006 found no greater benefits from whole body cryotherapy over traditional, localized cryotherapy in patients with rheumatoid arthritis. After nearly 50 years of research, there are still too few clear results, even fewer replications of those results, and definitely no consensus on whole body cryotherapy. As I change out of the robe and clogs, my limbs start to come back to life and I start to calm down. But before I get too comfortable, Fryben finds me and whisks me off to the exercise bikes to get my blood moving a little more. Fryben tells me she first encountered whole body cryotherapy when her mother had knee replacement surgery in Poland and was told whole body cryotherapy would help her recovery. After seeing the line of people outside the facility waiting for whole body cryotherapy treatment (often covered by Polish health insurance) and her mother’s extremely quick recovery time, Fryben decided to try it herself. After a few sessions, she says her entire body felt better and she knew she needed to bring it to the States. KryoLife became a company in April 2012 and just opened its doors in October. Fryben prides herself on promoting KryoLife as a wellness facility, with whole body cryotherapy being just one facet of many that will eventually include other types of physical therapy and nutrition consultation. For her, it all comes down to stress reduction. And her aim with KryoLife is to encourage using WBC as a complementary therapy along with those other healthy lifestyle practices. Right now she says she’s just waiting for the “disorganized” research to back up what she already knows about whole body cryotherapy. And reaching out to doctors like Glat is the first step. “We’re excited to try to create some of the science to prove how well it works,” Glat agrees. But that science is still a long ways off. The cryosauna I was in is still the only one KryoLife has. 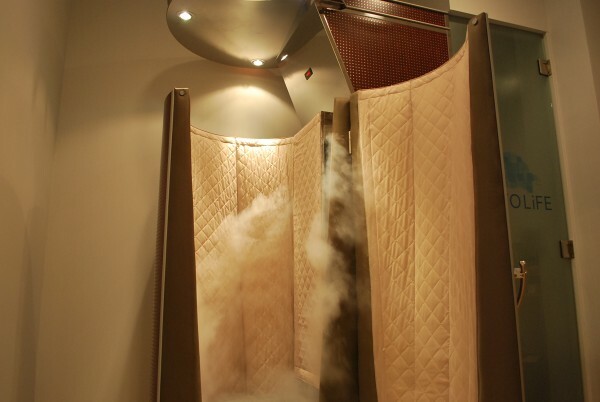 Although there are other whole body cryotherapy facilities on the West coast, (like CryoHealthare in Los Angeles and US Cryotherapy in Roseville, CA that charge around $35 per session and Fryben recommends at least 10 sessions) few of them seem to share Fryben’s well-rounded lifestyle approach. A day later I feel disappointingly unchanged. I felt free and wild and happy when I first stepped out of the machine, but I had also just been released from the impending doom of my cryo-coffin. I ate my lunch in about three bites, but was that because I had an artificially accelerated metabolism or because I hadn’t eaten anything since that handful of almonds I grabbed in my rush to meet Fryben? As long as the science lags behind the practice, we won’t know, and I’ll remain skeptical. Sarah Jacoby recently graduated from Reed College where she studied behavioral neuroscience. She loves Alan Partridge, the Eels, and the limbic system. You can follow her on twitter (@sarah_jacoby) and tumblr (sarah-tonin.tumblr.com).